Sherry, Tisamarie B., Sebastian Bauhoff, and Manoj Mohanan. 2017. Multitasking and Heterogeneous Treatment Effects in Pay-for-Performance in Health Care: Evidence from Rwanda. American Journal of Health Economics, 3, 192-226. Although performance-based contracting in health is becoming much more widespread in developing countries, there is limited evidence on the unintended impacts of these types of contracts, as predicted by contract theory. 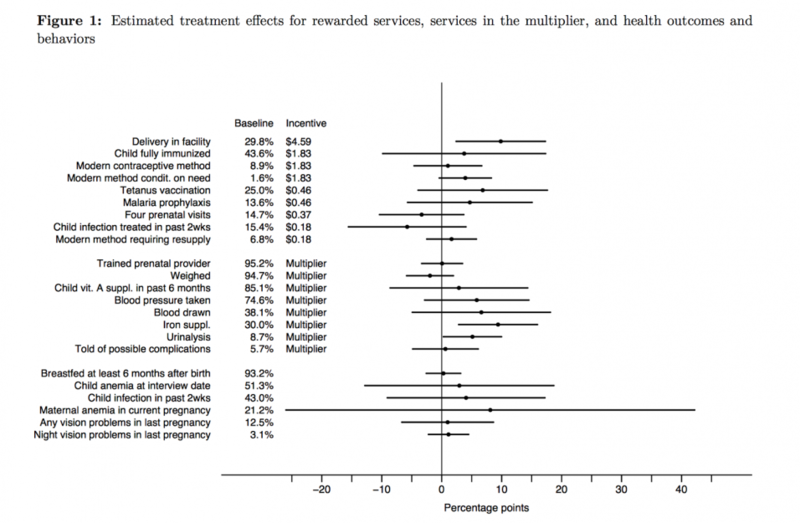 In our recent paper in the American Journal of Health Economics, we focus on multi-tasking (which could lead to improvements in rewarded services being made at the expense of unrewarded outcomes) and heterogeneous effects across different types of healthcare facilities in the context of Rwanda’s 2006 national pay for performance program. We analyze two waves of data from the Rwanda Demographic and Health Surveys (DHS), conducted before and after the randomized roll out of the program. Our results show that the program improved some rewarded services, as well as some services that were not directly rewarded. We do not observe statistically significant negative effects on unrewarded services, nor do we observe statistically significant impacts on health outcomes. We do not find evidence that is clearly suggestive of multitasking. We find evidence of heterogeneity; program effects vary significantly by baseline levels of facility quality, with facilities in the medium-quality tier showing more improvements than those in higher or lower quality tiers. Our results have implications for the design and scaling up of pay for performance programs in resource-limited settings.